If you just purchased a new home – congratulations! Being a homeowner is a great feeling. And although owning your own home is a wonderful achievement, it comes with responsibilities. You’ll no longer be calling your landlord when the pipes back up – that job is yours now. If you’re just getting started in your new home, then you should stock up on essential tools that you’ll need for basic repairs and maintenance. Here’s a list to get you started. One of the first tools you need is a claw hammer. This allows you to both hammer nails and remove them without damaging the surface on which you’re working. Buy a good quality hammer made from materials that will reduce vibrations. Opt for a straight claw rather than a curved claw as it can also be used for demolition. Next up, you need to invest in a good set of screwdrivers. You will use these all the time. Your set should contain screwdrivers in various sizes to use with both Phillips and straight-blade screws. You might not realize it now, but a cordless drill will become one of your most-used tools. Buying a cordless version means you don’t have to be close to an outlet to get the job done. Choose one with variable speed that is reversible. Also be sure to pick up an assortment of drill bits and screwdriver bits. Is there anything worse than finally hanging a piece of art and realizing when you’re done that it’s crooked? Save yourself the headache and buy an inexpensive level. An assortment of pliers will help you to grip items firmly when you need to. Choose a set that includes needle-nose pliers, locking pliers, and combination pliers. If you don’t already own a tape measure, now is the time to get one. It will be invaluable as you move into your new home. Choose a ¾ inch wide model that locks. You might also want a small one to carry with you on shopping trips. A staple gun is a handy tool for quick fastening jobs like re-tacking carpet or installing insulation. There’s no need to get an electric or pneumatic model; a simple manual staple gun will get the job done. A utility knife is the best friend of a new homeowner. You’ll use it constantly as you break down all those boxes you’re unpacking. It will also save your kitchen knives from wear and tear. 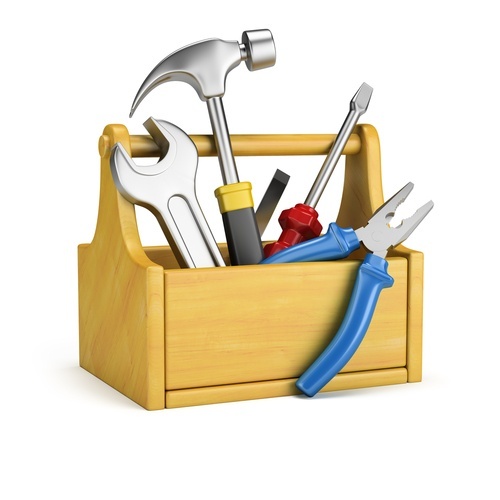 You will also want to pick up a set of wrenches for removing and tightening bolts around the house. Choose a small set of SAE wrenches as well as a set of Allen wrenches. Finally, don’t underestimate how important a toolbox can be. You can’t use your new tools if you can’t find them. The best way to keep them organized and ready to go is to store them in a toolbox. This way, you can easily carry them around as you work on the home, and you always know where to find what you need.